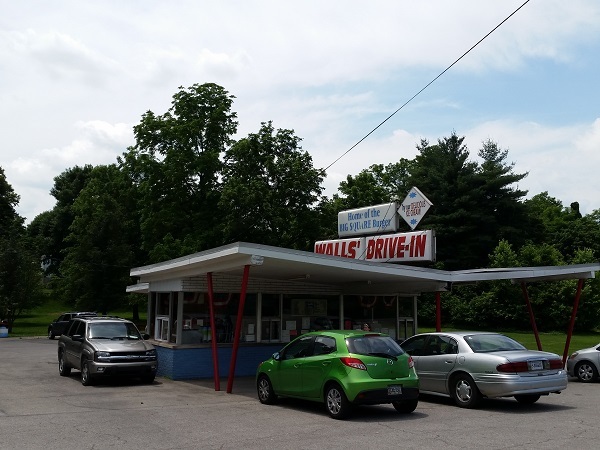 Walls’ Drive-In, Cannelton IN (CLOSED) – Marie, Let's Eat! 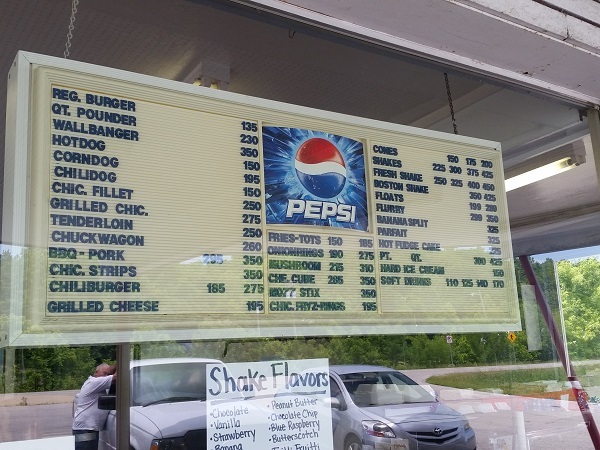 Walls’ Drive-In ranks among the most difficult places to find of all the restaurants we’ve visited since 2010, and it simply should not be that way. Let’s note the problem finding the place first before anything else. Its address, which I confirmed when I visited, is simply “Highway 66.” I plugged that into Google Maps in late May, and it found a site twenty miles west, literally at the next bridge downstream. They finally seem to have figured it out about a week ago. The young lady working the window confirmed that their delivery drivers often complain that they can’t find the place. Here’s how to fix this: Walls’ Drive-In is located at 3888 Ohio River Scenic Byway, Cannelton IN 47520. Put that in your GPS or Waze. It is within walking distance of the Bob Cummings Lincoln Trail Bridge, an absolutely gorgeous old steel truss that connects Cannelton with Hawesville KY. If you are coming from Kentucky, cross the bridge, turn right on IN-66 and you’ll see it immediately ahead on the right. 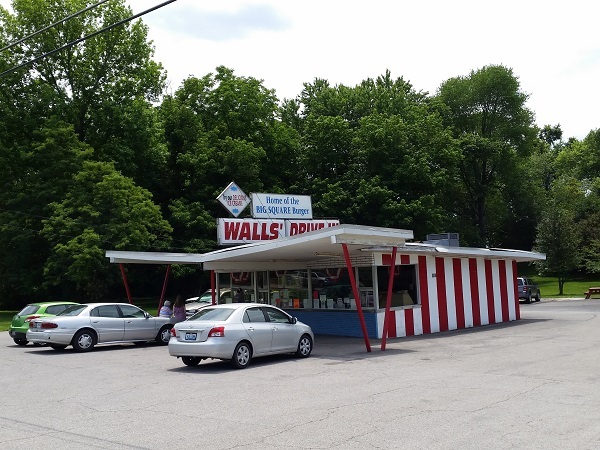 Now that we’ve got that out of the way, Walls’ is a classic fast-food drive-in from the 1950s. According to Roadside Architecture, it was originally a Tastee Freez. 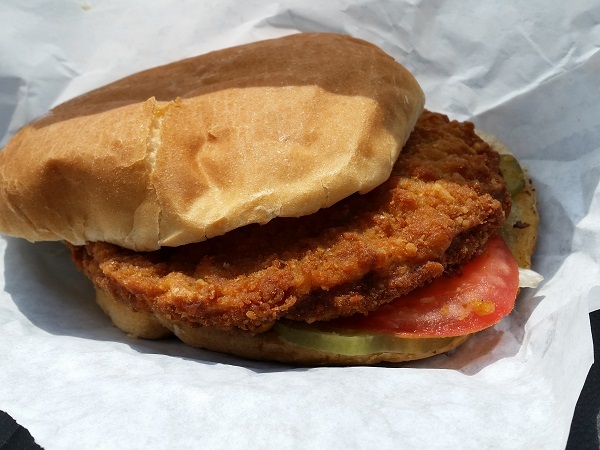 The principal attraction to people in the southeast is that this appears to be the closest place to most of us to sample the celebrated Indiana breaded pork tenderloin sandwich. While I really did enjoy stopping at Walls’, unfortunately the sandwich here was a slight letdown. It tasted just fine, but across Indiana, there are monstrous, fried-to-order tenderloins and I was really looking forward to seeing one of these too-big-for-the-bun bad boys. Take thirteen minutes and watch this terrific video by Jensen Rufe about tenderloin sandwiches, and compare those to the slight little thing that Walls’ offers, shown below. Do we have any Hoosiers reading? Can I get one like you see in the video around Evansville, or do I need to head further north? How far north? Bloomington? Hungry minds want to know. Happily, while the sandwich was not what I hoped to have, I had a terrific drink with it. Among the special offerings at Walls’ is a cinnamon milkshake. Somehow this combination has never occurred to me. I’m sure I must have seen this on the menu of many places before as an option, but if so, I guess it never stood out. You know what a cinnamon milkshake tastes like? It tastes like heaven. I want one all the time now. As I was waiting for my food and snapping some pictures, a fellow pulled up and noticed an old acquaintance propping up the side of the building. While I chatted about Boston shakes and square burgers, another specialty at Walls’, with the girl at the window, these two fellows talked at length about some labor unrest at the nearby Century Aluminum plant, which seems to be one of the biggest employers in the area, and indeed I saw small road signs that said “Shame on Century” for the next thirty miles. The problem’s none of my concern, but I hope that everybody gets it worked out. The drive west through Kentucky, dotted with the signs, was a beautiful one despite the lingering unhappiness that many in the region must feel. Posted on July 13, 2015 August 22, 2017 by Grant G.Posted in dairy bars, indiana, roadfood, sandwichesTagged breaded pork tenderloin, cannelton, drive-ins, indiana, roadfood.com. Walls’ was at one time Walls’ Tastee Freeze, I believe. I am 66 and remember going there on dates. I was sad to learn that Walls closed a couple of months ago, but I’ll always remember their cinnamon shakes! Pingback: Ice Cream in Orlando – Marie, Let's Eat!